IDF opens new operations center in Judea, following $40,000 donation from International Fellowship of Christians and Jews. The IDF’s Judea Regional Brigade unveiled a new command post in the town of Otniel in the South Hevron Hills, at a special ceremony Thursday. The new command post, which will be manned 24 hours a day, will help coordinate security responses in the South Hevron Hills region. Israeli army Colonel Itamar Ben-Haim, the current commander of the IDF’s Judea Regional Brigade south of Jerusalem, attended the ceremony, along with MK and Otniel resident Yehuda Glick (Likud), South Hevron Hills Regional Council chief Yochai Damari, and Rabbi Yechiel Eckstein of the International Fellowship of Christians and Jews. Col. Ben-Haim has led the Judea Regional Brigade, which is charged with maintaining security in the Hevron district and South Hevron Hills area, since this August. The new commander center in Otniel was built with money donated by the International Fellowship of Christians and Jews, a US-based non-profit organization aimed at combating anti-Semitism, promoting immigration to Israel, and supporting Israel. 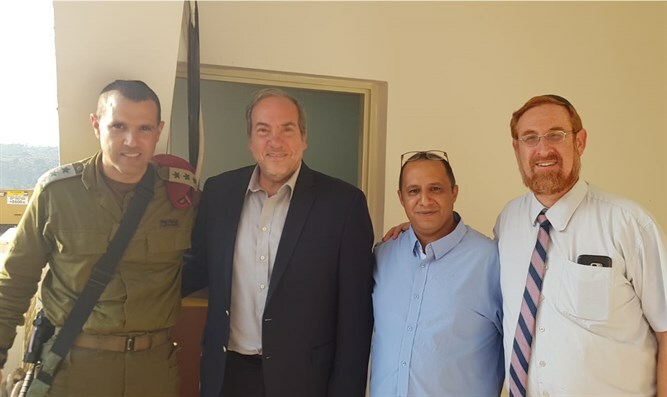 Rabbi Yechiel Eckstein, founder of the International Fellowship, expressed his admiration for residents of the South Hevron Hills area, adding that he had long dreamed of living in Judea and Samaria.